Looking for a salad that is truly tasty? If getting the recommended amount of vegetables a day (let alone green ones) isn’t always a piece of cake, try this delicious salad recipe that employs the tastiness of bacon to bring the family flocking to the table. If you’re vegetarian, don’t worry! There are a few ways to make this salad almost as yummy as the baconized version. Actually, even if you’re vegan (as a number of Salt Springers are), I’ve got some tips for how to make a meat-egg-cheese-less version as well. Of course, I can’t vouch for the same degree of tastiness as the original version as I’ve never attempted to alter it this way. Give it a try! *For vegetarians, or those that just don’t want the hassle/grease of cooking up bacon, substitute little chunks of cheese. Or cook up some meatless Stripples/Breakfast Strips, available at the ABC in Abbotsford or for sale on Amazon. I personally love these, having grown up vegetarian (and mostly vegan) myself. *Vegan? Forget the bacon or cheese, and try making this vegan-friendly version of mayonnaise. Step 1: Get the bacon (or Stripples) cooking. I used a fry pan this time, as my oven was full, but either way works just as well. Step 2: Chop up the broccoli and red onion. 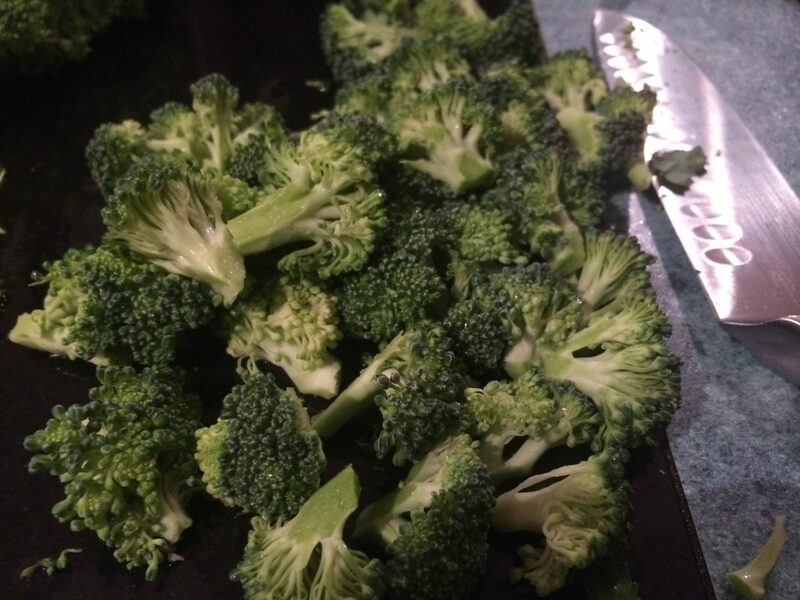 I find chopping up very small pieces makes it taste better. Also, notice how I’ve made cuts in the onion in a checker-board pattern before cutting off slices? If you want to dice an onion, this is by far the easiest way, I find. 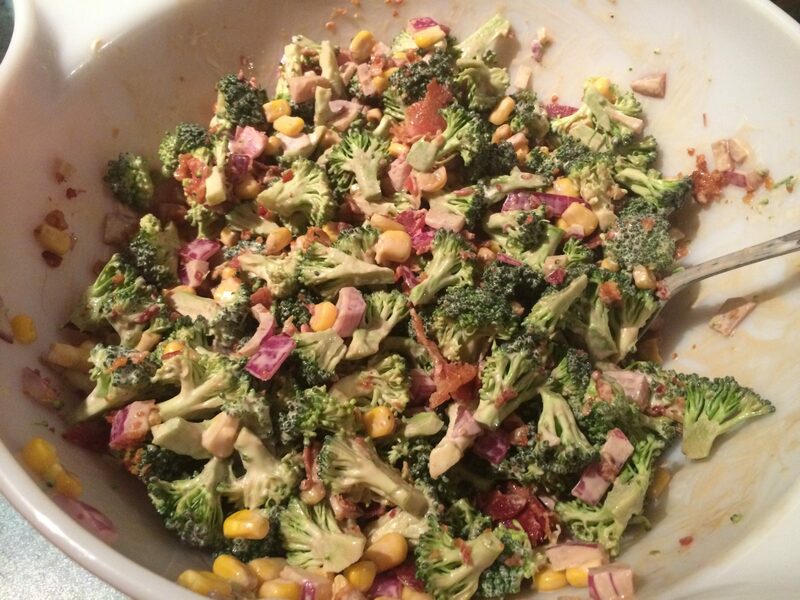 Step 3: Toss the broccoli, onion, and corn in a bowl. This time I made it easy and used canned corn, but you could cook up an ear or two and carve off the kernels to use if you want to avoid canned foods. Step 4: Add mayo and vinegar to your salad. Put as much or as little of each as you like. I prefer balsamic vinegar, so that’s what I used this time, but if you’re picky about looks you could go with white vinegar for some tang that doesn’t give your salad a somewhat brownish hue. Step 5: Take that deliciously cooked bacon and set it on a paper towel or napkin. Take another napkin and push it on top of the bacon to take away as much grease as you can. Don’t worry about being gentle – use the handy napkin sandwich to squish and crunch your bacon into crumbly bits, then toss it into the salad. There you have it! A delicious side dish to add to your dinner plans. Enjoy, and don’t forget to share this salad idea with your friends and family for them to enjoy too!